Just Eat is the world’s leading marketplace for online food delivery, operating in 13 markets around the globe. Our app allows customers to search for one of the 2,000 restaurant partners that are signed up to Just Eat in Ireland, helping to connect people to their choice of food at any time of day, any day of the week. As with any technology driven company, we are constantly evolving. Using our own business insights and market intelligence, we are watching trends and anticipating the changing needs and desires of our customers. We work with our restaurant partners to ensure that we have the range of cuisine types, the offers and the service that people are demanding – sharing the insights with them so that they can constantly be ahead of their customers. Healthy options, lunch time options, gluten free, paleo, group orders – we work seamlessly with our partners to ensure that we are ahead of the trend. From a personal perspective, I have also harnessed changes in technology to help achieve a positive work life blend. Our HQ is based in Dublin. However, because of the nature of the job I am constantly on the road for meetings. Through technology I can meet with my marketing team or a client in Cork on the go if I need to via Google Meet. Technology has allowed me to do more and be present at a lot more meetings. I also take advantage of my devices to work from home on days when that is possible. As a leader and disruptor, at Just Eat we pride ourselves in our ability to continue to innovate. Our Group Chief Technology Officer is focused on the future, working with our team of engineers to drive R&D and fuel innovation, not just for the benefit of customers but also to help ensure that we work more efficiently and effectively. We harness the power of social media to promote the Just Eat offering and to stay connected to our customers. Our social media platforms have massive followings here in Ireland – growing over 20% in the past two years. 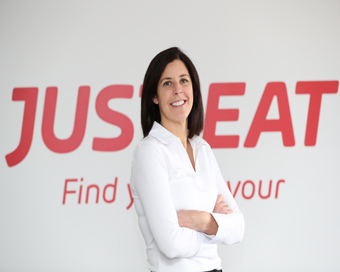 Just Eat offers a range of career opportunities in a fast growing technology company which is atypical to the ‘career in tech’ that people might consider. The reality is that in everything we do, technology is at the heart. Whether it is digital advertising plans, social content creation, engaging customers and restaurant partners, monitoring service levels, business and data analytics or customer experience, it is all driven by technology. As a member of the technology sector, we are conscious of our role and responsibility to help encourage more young people to consider careers in tech – and specifically, to encourage more young women to take advantage of the great opportunities that are out there. It’s important though, that when seeking to encourage girls to make the right subject and course choices that we don’t stereotype the roles. Technology skills and understanding are a passport to the future. They will be central to every role and every industry no matter what you choose to do. But just because you are a great programmer or a talented engineer, remember that this doesn’t preclude you from having the opportunity to help build a new and exciting brand or have the opportunity to disrupt or enhance a traditional industry. It’s still all about meeting needs that exist, it’s about having creative ideas, being hardworking and passionate. Combine all of these traits with IT skills and there are no limits as to what can be achieved. In any industry. In any corner of the world. Technology is bringing us all closer, and as with Just Eat, is connecting us like never before and making life easier. I would encourage all young girls to look at how technology can enhance their lives and help to ensure that they are personally fulfilled, while also having an impact in any career or industry that they might choose to be involved with.